Sunday brought with it two things: A hot wind that blew all the sheets off my convenient clothesline in the backyard and my annual desire to watch Gone With the Wind. Chup has never had the pleasure of viewing, and since he went to all the trouble to buy me the Collector's DVD for Christmas I think he figured he might as well watch the darn show. When we got all situated on our mile-long couch and plenty of pillows we started the movie. From the first scene of Scarlett's flirtatious fickleness with the Tarleton boys to the moment when she first sees Rhett and says "He looks as if he knows what I look like without my shimmy." I was enjoying myself, as usual. Then . . . there came on the screen, the serene southern gentleman . . . ASHLEY! What is this passionate love I am suddenly feeling for Ashley? Clearly I am a Rhett Butler gal. I root for the rascal, the "nasty dark one." I love his evil smile and sarcastic ways and how he never takes Scarlett seriously unless he is mad drunk. But oh sweet Ashley! Smart and kind, honest and humble! He has big ideas and yet faces reality with a sincere soul. And the curly blond hair, indeed. Chup adjusts his pillows and rotates his hips just a little. And it hits me. Chup is Ashley. In almost every way. A little bit heroic, a little bit tragic. Since I was eight-years-old I have identified myself with Scarlett. I start to worry that Chup might realize right now--as we watch this epic on our monstrous couch--that there are Melanies out in the world. Saintly, smart, angelic Melanies who are happily married to Ashleys. 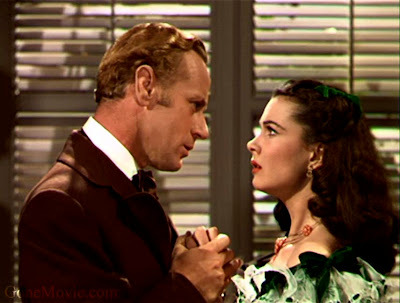 Mostly, I am afraid that Chup will come to realize the wife he is sharing the gigantic couch with is nothing more than a self-centered, simple minded, southern (Provo) Scarlett O'Hara. Will he at any moment see the comparison of Scarlett and his wife of 5 years now and say,"You still think you're the cutest trick in shoe leather." (To quote Rhett.) ? "Who would you rather be married to, Scarlett or Melanie?" Chup looks at me like I "have gone idiot." (To quote Jonas Wilkerson the overseer). "Melanie." He sighs and starts watching again. I know Scarlett is no character of integrity. But she's naive, willing to try anything to get what she wants and a shameless flirt. She's got a "passion for living" (to quote Rhett, quoting Ashley) and a closet full of gorgeous dresses. Me, me, me, I've got it too and so do I.
I have a hope. Maybe the Collector's DVD has alternate endings. I will choose the one where we see that Melanie steals Ashley from Scarlett just so that she could set up a spy encampment at 12 Oaks wherein she sends sensitive information to Abe Lincoln and his Yankees about southern unrest and therein actually start the CIVIL WAR! Plus she is really married to Rhett! This much I know, Chup can't watch more of Scarlett, he just can't! His heart will tell him that Melanie is the only way to go. Growing up, I thought I needed a Rhett Butler--and married one--only to discover that he was no good for me. Us Scarletts need Ashleys, but Ashleys find us exhausting. What is a Scarlett to do? Just as we are putting on DVD 2 our doorbell rings. Davey and May show up with Adelaide just in time, and Chup loves the Addie. We share a nice hour with them on the front porch. After that it was time to visit my Dad for Father's Day. When we arrive home well after ten pm, I can tell Chup is too exhausted to finish the show. "We can finish it tomorrow." He suggests, thinking he has to be apologetic. But in my mind I am worried about tomorrow, Scarlett gets even nastier in the second half. There is nothing I can do at this point. After all... tomorrow is another day.